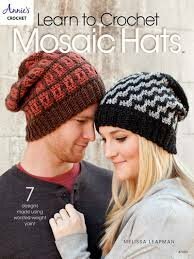 Using clear instructions and photos, this book will walk you step-by-step through making a basic mosaic fabric and includes patterns for 7 hats. These complicated-looking patterns are created by working simple two-row stripes. On successive rows, stitches are worked into the rows below to create the intricate patterns. It's as easy as that!